President Robert Mugabe wants Victoria Falls to be renamed ‘the smoke that thunders’ to get rid of its colonial history. The president of Zimbabwe believes Victoria Falls does not reflect its liberation heritage. The waterfall, which is along the Zambezi River at the border of Zimbabwe and Zambia. is one of the Seven Wonders of the World. Locals already refer to the landmark as Mosi Oa Tunya – which means ‘the smoke that thunders’. The ruling party, Zanu PF, said the government would be instructed to get rid of all colonial names for towns and schools. It was first discovered by Scottish explorer David Livingstone who named it after Queen Victoria. Jabulani Sibanda, leader of Zimbabwe’s vocal war veterans, supported the move. He said: ‘David Livingstone was not the first person to see the Victoria Falls, they (the falls) must be rebranded Mosi Oa Tunya. President Mugabe’s party came to power in 1980 and changed names of some cities and towns such as Harare. However, a number of institutions and roads still have their colonial names. 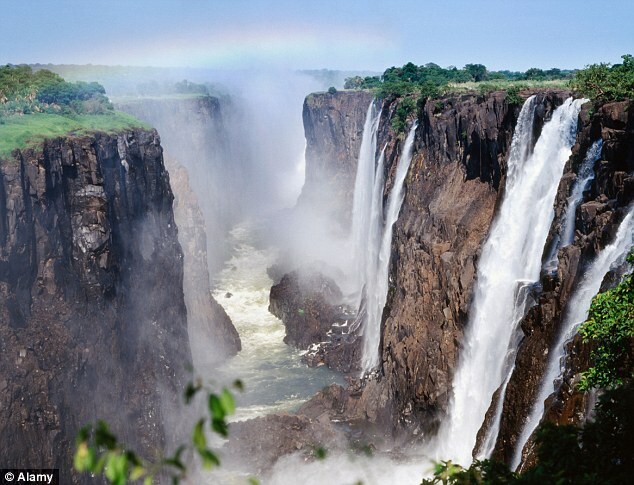 Victoria Falls is known as the greatest curtain of falling water in the world. Columns of spray can be seen from miles away as and at the height of the rainy season, more than five hundred million cubic meters of water per minute plummet over the edge of Victoria Falls, over a width of nearly two kilometers, into a gorge over one hundred meters below.